“So what the hell is Red Friday?” We hear you ask! Around 75% of our members tell us that they heard about Econsultancy through a colleague, and this got us wondering whether we could give this an extra end-of-year boost with a special offer. Normally promotions at this time of year are designed specifically to part you from your hard earned cash, but as we’re celebrating both a birthday and Christmas we thought we should give our members a reason to rejoice as well, so we’ll be offering you a massive 30% off all online purchases in the week leading up to Friday the 17th of December 2010. Or as we prefer to call it: Red Friday! And that’s not all. In return for taking advantage of this offer, we’re also going to be giving away £10,000! We’ll give every member a unique 30% off code that you can distribute across your network in any way you see fit: Tweet it, blog it, post it around your LinkedIn or Facebook groups, email it, include it in the company newsletter or hire a plane to write it in the sky at your annual conference. Anything goes, and whenever anyone makes a purchase using your code, you’ll move higher up our leaderboard, and closer to our grand cash prize! Remember, every purchase made with your code between 9am today and midnight (GMT) on Friday 17th December 2010 will count towards your grand total, including purchases you make for yourself, so if you’re planning to subscribe or upgrade your exisiting membership, sign up for one of our 2011 training courses or even post an ad on our Job Boards then now is a great time to act! We’ll be publishing a leaderboard of the top 30 places so you can see who the most influential members of the Econsultancy community are, and more importantly, check how close you are to that top prize spot. There’s no catch, and this certainly isn’t a way for our marketing department to sit around drinking sherry and eating mince pies while you do their job for them. Where would you get an idea like that? In fact, we’re even happy for you to try gaming the system – we’ll be counting purchases you make for yourself, and we’ve published a list of hints and tips to help you out over on our Facebook page. Face it: We want to give you money! At Econsultancy we’re always keen to experiment on ourselves to see what works and what doesn’t. And as B2B case studies are rare, we’ll let you know how we get on. Red Friday is intended to be an annual giveaway and e-commerce test case to reward our members and have a bit of fun at this festive time of year. H&M released an updated version of its iPad app this week, adding the ability to make purchases through the app. The fashion retailer’s recent UK e-commerce launch was a big disappointment, so does the iPad app offer a better user experience? 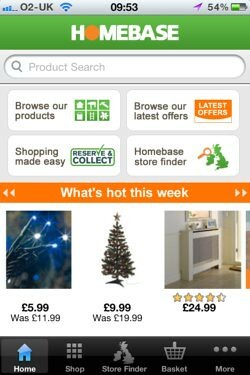 Having already released a successful app for Argos (which has been downloaded almost 1m times), Home Retail Group yesterday launched a reserve and collect app for Homebase. Homebase has seen a 600% increase in online sales via mobile in the last year, and users have made 3m stock checks on the main website since February, so a mobile launch makes perfect sense. In April 2009 I flew to Australia with Qantas, a brand I’d always heard good things about. I’ll spare you the details but the long flight sucked. So I decided to write to customer services to issue a light complaint, in the hope for a bit of love on the return leg. I contacted Qantas via a form on its website, while logged in to my frequent flyer account. An auto-response email was promptly fired back at me. Some 18 months later I’m still waiting for a proper reply!